In 1785 the French Government sent André Michaux, a botanist, to document plants and trees in America. Samples of plants he found in the colonies were to be sent back to France for planting in the Royal Gardens. After a short stay in New York and New Jersey, Michaux settled in Charleston, South Carolina where he established a garden for his collections. Sunday 3rd of April (1796) arrived at Bennet Smith's, 12 miles from Lincolnton: remained all day to pull shoots of a new Magnolia with very large leaves, auriculate, oblong, glaucous, silky, especially the young leaves; the buds very silky; Flowers white Petals with a base of purple color. Stamens yellow, etc. Along the Creek on the bank of which this Magnolia grows I also saw the Kalmia Latifolia (Mountain Laurel), Viola Lutea, filiis Hastatis (Arrow Leafed Yellow Violet), Ulmus viscosa (Elm Tree) then in process of fructification; Halesia (Silverbell Tree), Stewartiapentagyna (Camellia). The "12 miles from Lincolnton at home of Bennet Smith" mentioned in his journal was on Hoyle's Creek near the town of Stanley. The tree which Andre' Michaux subsequently named the Magnolia macrophylla, has not only the largest simple leaves, but the largest flowers of any tree native to temperate North America. It's giant leaves measure up to three feet long and are often a foot wide while the flowers sometimes reach 18 inches in diameter. His journal continued: The 4th - started and crossed Tuck-a-segee ford on the Catawba River 10 miles from Bennet Smith's. Took the road to the left instead of passing by Charlotte and slept 11 miles from Catawba River. Other entries in the journal of Andre' Michaux mention staying in the home of the well known Peter Smith. A drawing of Jack C. Moore standing beneath the large leafed Magnolia trees on his property on Hoyle's Creek. Jack owns the lands today on which Andre' Michaux discovered the Magnolia macrophylla. Today (1999) the trees are found, in Stanley, primarily on the property along Hoyle's Creek, and on the banks of Stanley Creek. home on Hoyle's Creek and retrieved seedlings of the Magnolia macrophylla and transplanted them on the grounds of his new home, which was thereby named Magnolia Grove. Michaux not only sent botanical specimens home to France, but he was responsible for introducing to this country the Crepe Myrtle, the Ginkgo Tree and the Mimosa Tree. Though Andre' Michaux was in the service of the French Government during his eleven years of exploration in North America, he also became well acquainted with the politically elite of this country such as George Washington, Thomas Jefferson, John Adams and Alexander Hamilton. He was, at one time, propositioned by these men, as well as 26 other well known members of the American Philosophical Society, to explore the lands beyond the Appalachian Mountains to the west and report back to them his findings. (This being before the Lewis and Clark explorations). Michaux declined the proposition, though he did eventually journey to the west, but did so at the request of France, his own country. In August of 1995 the Brevard Station Museum was visited by Mr. Charlie Williams of the Treasure Tree Committee, Mecklenburg Forestry Assn. and the Charlotte-Mecklenburg Library. Mr. Williams tells us that their research so far tells them the MAJOR LOCATION of Michaux's Magnolia macrophylla in the state of North Carolina is in the STANLEY AREA. 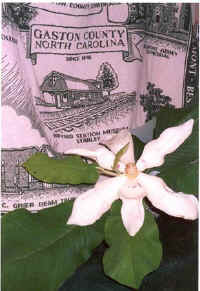 Michaux made his discovery along the banks of Hoyle's Creek, however, the Magnolia macrophylla has also been located along the banks of Stanley Creek, along the Catawba River in the Spencer Mountain area going toward Lowell, McAdenville and Mt. Holly, as well as some other places in the Stanley area.